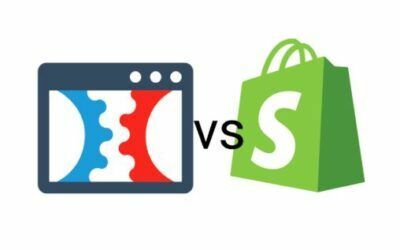 Clickfunnels vs Shopify: Which Is The Best Software For Your Business? Clickfunnels vs Shopify: Which Is The Best Ecommerce Software For Your Business? Which Is The Best Ecommerce Software For Your Business? Let’s talk through another digital marketing tool debate. There are a number of Clickfunnel alternatives. This time, let’s focus on Clickfunnels vs Shopify. These are two well-known pieces of online software for e-commerce. However, it is important to make sure you invest in the right one for your business. In some respects, they are both useful for different functions so you could even integrate the two or use them for different purposes. For now, let’s look at the features they offer and try to come to a conclusion as to which is best… Keep reading for the Clickfunnels vs Shopify contest. What features does Clickfunnels offer? Let’s start with what we know (and love), on the left side of the Clickfunnels vs Shopify debate. Clickfunnels offer a range of pre-built marketing funnel templates which are all tried and tested. There is therefore almost a guarantee that using the provided templates will increase your conversion rates. There are funnels available to suit almost any business, no matter the product or service you are selling. For example, for physical products, courses, memberships, services or even webinars (the new craze). The clear advantage of Clickfunnels is the ease with which it can be used and benefited from. The tools are suitable for anyone, no matter how much experience with technology or business you might have. So, if you are completely new to the sales or marketing world, Clickfunnels is perfect. As well as being easy peasy to use and suitable for a range of businesses, Clickfunnels will get you results. Typical online shops display their products largely in a nonchalant, buy if you want, type of way. There is normally an attractive image alongside a description. Clickfunnels go above and beyond this. Each landing page shows your product or service alongside what could be considered a sales pitch. They include an eye-catching image or even a video to really make the customer think they are getting an amazing deal. As well as actively selling rather than just displaying, Clickfunnels offer visitors one option. There is one Call To Action (CTA) button on each page, where customers can either enter their details to receive the offer or leave the page. This is different from online shops like Shopify where the pages have a number of distractions, which definitely affect your conversion rates. For this reason, we would recommend Clickfunnels for any type of e-commerce… if you want guaranteed results from your marketing efforts. To further our lefty stance on the Clickfunnels vs Shopify debate, Clickfunnels offer an email marketing feature too. Due to people having to enter their email addresses to receive your initial offer, you will likely collect an extensive email contact list. You can use Clickfunnels to create automated email campaigns where you can group people into demographics or go even further. This means that when people receive your marketing emails they will be more personal. If people feel like an effort has been made on your behalf they are much more likely to buy. Clickfunnels allows you to retarget your email list numerous times with different deals, whether this is upselling or downselling. You can also contact people with one-time offers, order bumps and more. This isn’t an option on other e-commerce websites like Shopify. Clickfunnels even allows you to further upsell a product if a customer declines your first offer. One feature which has proven success is ‘product bumps’. You can put an option for customers to add an extra discounted product onto their order at the checkout. If you receive a bit more money from each customer the increased profits will all add up! Every little helps. As well as offering pre-built templates for your marketing strategies, Clickfunnels allows complete customisation. Shopify has a set order form, whereas Clickfunnels lets you make your order form look exactly how you want it. A good-looking order form is likely to increase your conversion rates and sales. Despite offering you the option to personalise your funnels and email marketing campaigns, you can be lazy too. The extensive variety of ready-made templates means you can simply add your own content and images if you prefer. Something Clickfunnels offers which Shopify does not is the option to make money from affiliate marketing. With Clickfunnels, you can earn commission from any Clickfunnels product sold or new paying sign-up. The program works using its ‘sticky cookie’ feature. Once your funnel has been clicked on, any further purchase or sign-up activity by a visitor will earn you money. Clickfunnels are renowned for their detailed tracking system. Clickfunnels CRM allows you to view customers’ email and social profiles, demographics, product purchases, money spent and more. This allows you to group your email lists based on a huge range of customer characteristics meaning your campaigns will be more personalised and thus increase conversion rates. Clickfunnels’ ‘action funnels’ allow you to even automate the process of grouping your email lists according to your criteria. Your whole email marketing campaigns are therefore arranged and sent out without you lifting a finger! One of the main things that might make people second-guess using Clickfunnels is the price. Signing up for the most basic package will still cost you $97 per month. If you are an established or expanding business though, this shouldn’t put you off. Their marketing funnels and efficient follow-up email marketing tool are used by many big names and have had proven success for businesses all over the world. If you view it as though you are investing in a tool which will become a major component in your digital marketing strategy, the price seems reasonable. One area that Clickfunnels could be critiqued is its sense of community. Due to it being increasingly popular among businesses big and small, the size of the community has grown along with it. On one hand, this is great as it means your funnel creations are secure and Clickfunnels is highly unlikely to disappear at any point in the future. However, it also means that you will have less access to more personal advice and support. Clickfunnels is run and used by a lot of big names in the industry, Russell Brunson being one of these. We wouldn’t advise you to let this put you off though, as there is still plenty of Clickfunnels help out there. Russell Brunson uploads regular YouTube videos offering entrepreneurial and marketing funnel tips. Plus, there is a ‘live chat’ feature on the Clickfunnels website if you are ever in a dilemma that needs immediate support. What features does Shopify offer? Shopify is another online tool used by a number of big names for e-commerce, such as Budweiser and KKW Beauty. However, their sales approach is largely different from Clickfunnels and has been found to be less effective. Whereas Clickfunnels sell their products using dramatic images and text, Shopify doesn’t avidly convince people to buy. We recommend Shopify as software to use if you want to create an online shop with a range of different products or services. There is a large range of themes on offer with the online store builder. You can, therefore, choose and personalise the best theme to suit your brand. Plus, if your business offers physical products, there is an online inventory management system which keeps track of your stock. This takes away the burden of having to worry about how much stock you have to suit demand. Shopify will show you when you need to order more stock, simples. As well as allowing you to manage the stock of your products, there is a content management system too. This allows you to create a blog and keep on top of content to ensure your website is up to date and fresh. Having a blog is a great way to improve Google rankings or stay in prime position! One advantage of Shopify is it is relatively straightforward to use. The features do not require you to be tech-savvy in the slightest. Like Clickfunnels, the website builder tool uses a simple drag and drop mechanism. If you’re busy, it’s great to not have to invest time in wrapping your head around the software. On the other hand though, to use Shopify successfully you do need a certain extent of sales knowledge or experience. The software provides you with the right tools, but if you have no idea what to use to produce results, you will be stuck. It’s no use having all the gear but no idea! Exclusive shipping rates and payment integration. One way Shopify excels in the Clickfunnels vs Shopify debate is with its shipping and payment integration. Shopify work with a number of major shipping companies, such as DHL, UPS, and USPS. They have exclusive shipping rates which you and your customers can benefit from by using Shopify to sell your products. They also have an integrated payment processor. Shopify accepts payments from all major card companies like Visa, Mastercard, and even American Express, as well as over 50 online payment gateways like PayPal. Shopify also has a great online community, meaning you can find answers to any queries quickly. A quick Google is likely to give you any information you need! This is probably better for smaller companies, who are looking to benefit from the expertise of others. Clickfunnels falls down in this respect by not providing an interactive community. One area that Shopify has been known to struggle is with their conversion rates. Although the software is great for creating e-commerce stores, it isn’t effective to actively sell your products. Shopify is beginning to convert significantly less. Clickfunnels is the new popular tool that people are using to get around this. Where Shopify struggles, Clickfunnels makes up for it with their ‘in your face’ sales funnels. Why not use both? In terms of the pricing aspect of the Clickfunnels vs Shopify debate, neither is a clear winner. For a standard Shopify membership and access to their features, it is $79 per month – only around $20 less than Clickfunnels. A downside of this is that to access add-ons which help to increase conversion rates, like a checkout countdown timer, you have to pay extra. This is different from Clickfunnels where a standard package gets you full access to any sales funnel and even their affiliate program. If you would prefer to invest in a tool and then not have to worry about any extra costs cropping up, Shopify can’t promise you this. Another downfall of Shopify in comparison to Clickfunnels… Shopify doesn’t necessarily obtain email addresses. Clickfunnels doesn’t allow people to benefit from their deals without providing their details. This means that your business would be missing out on email marketing opportunities with Shopify. Clickfunnels allows you to retarget customers multiple times with follow-up deals, which is highly effective. Shopify only obtains people’s’ email addresses if there is a pop-up, such as ‘enter your email address for 10% off your first order’. This is sometimes effective but still gives people multiple options and allows them to close the pop-up and continue browsing if they wish. Clickfunnels likely has higher conversion rates as people have to enter their details or they simply don’t get the offer! The Clickfunnels pricing might seem hefty but it comes with guaranteed quality and results. The standard package comes at $97 per month and the Etison Suite package is priced at $297 per month. It’s important to keep in mind that, when taking into account the increased conversion rates that your marketing funnels will bring, it really isn’t expensive. Once all Clickfunnels features have been talked through, all Clickfunnels scam rumours are thrown out the window. It is a trusty and effective tool and is used by major businesses all over the world, so don’t miss out. Shopify is ever so slightly cheaper than Clickfunnels and offers more pricing package options. With Shopify you can start off with the very basic membership, costing only $29 per month. This is different from Clickfunnels where the cheapest membership is still $97 per month. Despite this, if you are an established business and know you will need full access to features it will cost you $79 per month, which is only around $20 less than Clickfunnels… With the two pieces of software being so similar in price, you may as well invest in the one you think suits your needs the best. We think Clickfunnels is recommendable if you are planning to expand. Shopify’s conversion rates are just not as high, especially more recently with the popularity and increasing effectiveness of marketing funnels. So, let’s sum up the Clickfunnels vs Shopify debate. The tools are similar in that they are used by big names and both have track records of success. Clickfunnels are promoted heavily by well-known individuals/businesses due to their direct yet effective method for improving sales. However, Shopify has the advantage of allowing you to create a successful online store with a range of products. Despite us being Clickfunnels users ourselves and understanding the success the software brings… You could use both of these tools for different purposes. Why not use Clickfunnels as your sales mechanism to present products and increase conversion rates? Whilst also using Shopify at the back end to benefit from their extensive payment/shipping integration and managing your product inventory? A final thing to keep in mind when choosing an e-commerce software is both Shopify and Clickfunnels offer free 14-day trials. Access your free Clickfunnels trial here. Think you need some more help? If this Clickfunnels vs Shopify discussion has been useful but you still need more guidance before making your decision… We can help. Give us a call on 01226 720 755 to talk through your options. Disclaimer: We are using affiliate links in this post. This simply means that if you choose to purchase Clickfunnels by clicking on a link, we will receive a little commission – no extra cost to you.